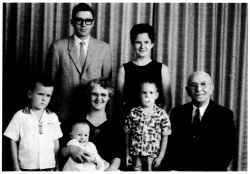 Conrad and Aletta Freko, Eva and Ian and children. whence derived his surname. He regularly commuted by row boat to school and church. At the age of 27 he immigrated to Canada via ship, and settled at Clanwilliam to work as a farmhand. Within the year, he worked again as a farmhand but for Ted Lee in the Erickson District. In 1917, he opened a meat market in Erickson, using skills he had learned with his family in Norway. Also, for three or four years, he ran a Model T Ford Livery Service for Erickson, and told many a tale of harried adventures delivering his clients to their destinations. In the late 1920's he took over O.J. Gusdal's Wolf Pens which were located between the North and South Lakes at Erickson near the Wickstrom Slaughterhouse. He became engrossed in wolf and fox ranching, later also breeding mink and badger. He crossbred red and silver fox to obtain beautiful cross-fox fur. By this time he had been a fur buyer for some time ­ muskrat pelts were 5-10 cents each in those days! He regularly sold pelts to Cyril Bell, a fur-buyer from Winnipeg, and also through the Dominion and Soudak Auctions in Winnipeg. In town, Gus raised mink, badger, and Chinchilla and Angora rabbits. They were housed in pens beside his fur shop on the north end of his yard. At Scandinavia, on June 19, 1918, Gustav married Olga Victoria Hemmingson, daughter of James "King" and Clara, at Scandinavia. Rev. S.O. Vangstad of­ ficiated, witnesses were Hedvig Hemmingson and Martin Bergeson. The newlyweds settled into Erickson, oc­ cupying their lifetime dwelling. Gordon James was born on July, 4,1920, and Beatrice Victoria was born on October 24, 1922. 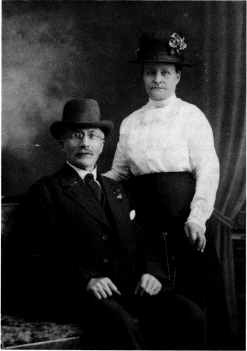 Both children attended school in Erickson, and participated in the Augustana Lutheran Church as did all the family. For many years Olga sang in the choir and was a member of the Ladies Aid Society. She participated in the "Helping Hands" group effort to provide relief materials in the war years. Bea was church organist. Gus was church caretaker for a time, a grandchild Pam, remembers watching with fascination as he replaced candles in the spring-loaded altar candlesticks! Bea was an athlete, and especially enjoyed baseball and curling. Gordon's mechanical talent surfaced early as he became a greasemonkey for Chris Skovmose. He also worked with Gus in their animal breeding endeavors. After the 1929 crash, Gus got out of fur ranching, and strictly purchased fur and hides. Horse and cow hides brought 3-5 cents a pound, whereas fur pelts ranged from 40-75 cents by this time. Gus was an expert at skinning and dressing fur. To prevent hair slippage, hides were salted liberally, folded up and tied with twine. They were stored in the hide house on the northwest corner of the home yard. Gus worked extensively and closely with local Indians through the marketing of their pelts, and also their gathered Senecca root. This basic ingredient in medicines and herbs was worth 35-45 cents a pound wet or green. Then it was spread out on the shop roof and on tarps on the grass if necessary. This task was repeated two and a half to three days in good weather to dry it sufficiently for storage.